Although you may be tempted to hold your baby all day, every day, unfortunately, it’s not possible. Throughout your day, you’ll have things to do, so you will have to put your little one down. Possibly one of the most overlooked aspects of being a new parent is where you will place your baby as you go about your day. You need somewhere safe, comfortable and something portable that you can move around as you move from room to room, allowing you to do your tasks while keeping an eye on your little bundle of joy. This is where a baby bouncer can make all the difference. A baby bouncer can keep your hands free, while keeping your baby close. But how can you be sure which baby bouncer is the best one for your child? To give you a helping hand, I’ve compiled a list of my favorite baby bouncers currently available. These are all comfortable and safe, giving your child the best experience, all without breaking the bank. 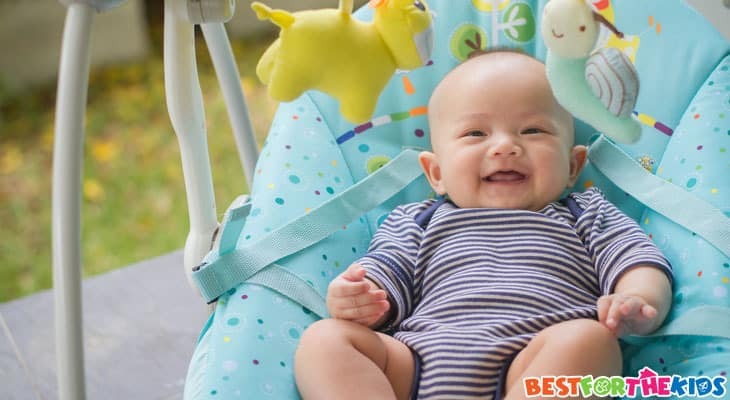 If you are not sure what you’re looking for when it comes to baby bouncers, my complete step by step buying guide details everything you need to know to make the best decision for you and your infant. There are so many different features and brands to choose from, but here are my eight all-time favorite baby bouncers that you and your children are going to love. To start off my list, I’ve chosen one of the best all-around, mid-range baby bouncers available, giving you a great solution that covers all your baby bouncing needs. This lightweight bouncer is suitable for children aged 2 and above, so you can move your child around the house with you so you to keep an eye on them. The interior is made using high-quality 100% cotton, providing a soft and comfortable cocoon around your child. This bouncer prides itself on its four, easy-to-operate positions, allowing you to adjust the bouncer based on your child's needs. 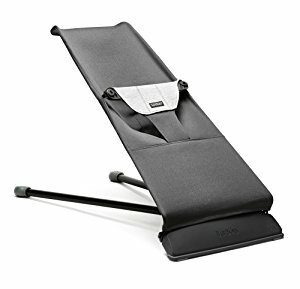 The bouncer can fold up completely flat; making sure you can efficiently store or transport it. This is a completely manual bouncer, meaning there are no wires to get in the way or batteries that need charging. 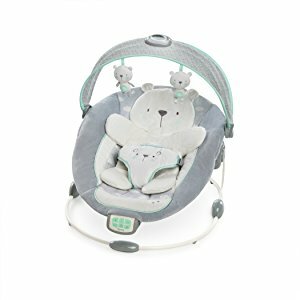 What's Great About It: In addition to the lightweight design, this high-quality bouncer provides your child with optimal neck and back support, so they remain comfortable and supported in both the resting and play positions. This compact and lightweight solution is suitable for children from the day they are born. Ideal for use up to the age of six months, this manual bouncer requires no power, batteries or charging, so you can effortlessly pick up and move your child with you wherever you go. The manual bounce function also helps to promote healthy muscle growth and motor skill development. This beautiful little bouncer prides itself on two easy-to-set positions, perfect for rest or play. The 100% cotton design provides optimal comfort, and is compliant with the leading American Safety Standards. The cotton fabric is easy to remove and is machine washable, meaning you can maintain the highest levels of hygiene without any trouble at all. What's Great About It: This bouncer is fully compatible with an entire range of BABYBJORN Flying Toy products, meaning you can keep your baby happy and entertained at all times. 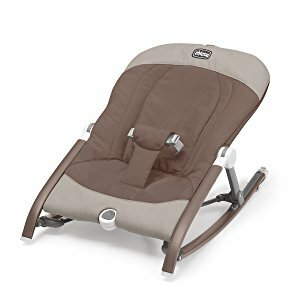 If you are looking for an ultra-compact bouncer that maximizes space, but offers your child great comfort and support, the Chicco Pocket Rocker could be the ideal bouncer for you. Easily the smallest and most lightweight bouncer on my list, you can take this bouncer with you wherever you go. The entire bouncer folds away into a small and convenient travel bag, allowing for easy transport or space efficient storage. When your baby is in the bouncer, the professional 3-point harness system ensures that your baby is safe and secure at all times. The rocker boasts three, easily adjustable reclining positions, providing full body support while your child is sleeping, resting or playing. The interior cotton of the seat is easily removable and machine washable, allowing you to maintain the highest possible levels of hygiene for your child. What's Great About It: This unique baby bouncer features a fully integrated kickstand, perfect for stationary use, allowing the bouncer to remain secure while you gently rock your baby with your feet, ideal for a calm end to an active day. If you’ve got a hyperactive child who needs a little more attention when in a rocker, the SkipHop Uplift Bouncer could change your life. This multi-leveled bouncer lets you set the position you want your child to be in, so they can enjoy activities that require different heights. 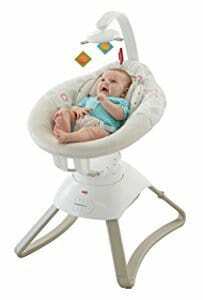 The height is set using the easily accessible knob, and you can set the bouncer to a height of up to 34-inches. The five-point safety harness secures your child safely in the bouncer, while the cotton blend interior provides maximum levels of support and comfort. As an electronic bouncer, your child can enjoy the added benefits of a vibration setting, and the bouncer includes four built-in sound effects and melodies, making bedtime one of the easiest parts of the day. For easy storage and transportation, this bouncer folds up into a compact, lightweight design with no assembly required, meaning you can start using this bouncer as soon as it comes through the door, and pack it away quickly and easily. What's Great About It: Suitable for babies of all ages, this high-quality bouncer puts your child first. The built-in, fold away toy bar allows you to hang your child’s toys to keep them constantly entertained. The auto-shut off feature turns off all sleep-induction settings, such as sounds and vibration, after 20 minutes of use, so you don't have to disturb your child by turning them off yourself. 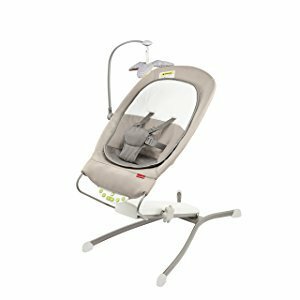 One of the leading baby brands in the industry, the Fisher-Price Motions Seat prides itself on the ability to create natural swaying motions, very similar to a parent bouncing and swaying their baby in their arms. There are three sway settings to choose from, and the 10 accompanying songs and natural sounds help your baby fall asleep quickly. Whilst in the bouncer, your baby can enjoy the overhead toys that will keep them occupied when awake. Maximum comfort is achieved using the adjustable two-position recline system that gives support where it’s needed most. This electronic bouncer easily plugs into the wall, so you don't have to worry about batteries dying or needing to be charged. What's Great About It: For parents looking to maximize the hygiene and cleanliness of the bouncer, each interior part is easily removable and safe for machine washing, so your child can enjoy a safe and clean experience in their bouncer. If you’re looking for a baby bouncer which is both comfortable and visually engaging for your baby, look no further than the Baby Einstein Bouncer. 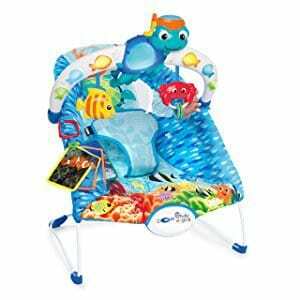 This colorful and vibrant bouncer is full of mentally stimulating objects that will keep your child entertained. One of the lightest bouncers on my list, it prides itself on its unique ocean sounds, lights, and melodies that provide an incredibly calming effect on your baby when it’s bedtime, while still keeping them engaged when they are awake. The bouncer boasts a two-sided toy bar, allowing you to easily attach your child’s favorite toys on the one side, while the other side sports flashcards, available in three languages, so your child can start learning early on. The bar itself is removable, allowing for easy access to secure and remove your baby from the bouncer using the three-point harness system. What's Great About It: In addition to being one of the most affordable bouncers on my list, the Baby Einstein Bouncer contains an extremely comfortable cotton interior that’s removable for easy machine washing, and contains added mesh panels on either side, maximizing the levels of comfort and ventilation for your baby. If you’re looking for a super-comfortable baby bouncer that doesn’t break the bank, the Sassy Bug Bouncer may be for you. 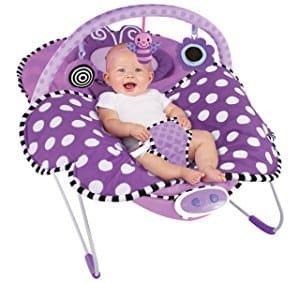 This lightweight bouncer has a soft, durable and comfortable built-in blanket that provides optimal levels of comfort when your child is sleeping, resting and playing. 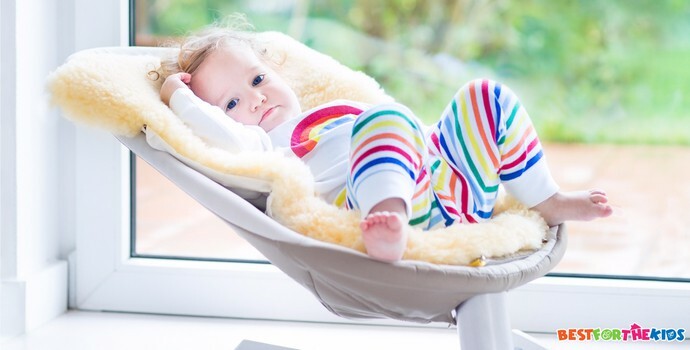 The unique, wide-angle design of the bouncer provides a snug cushion for your baby to lie on, which can be adjusted to two different positions, purposefully designed to support your baby’s body as they grow. At the top of the bouncer, you’ll find a high-quality toy bar featuring three plush toys that can easily be removed for bedtime or for easy access to your baby when you want to take them out of the bouncer. All three toys have a designated purpose, designed to promote healthy development in the areas of vision, touch, and hearing. 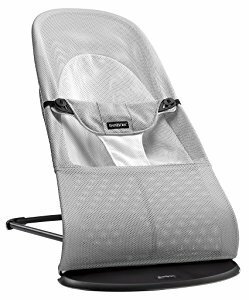 The cushion seat, head support, and cradling seat are all easily removable and safe for machine washing, allowing you to maintain the highest levels of cleanliness for your baby. What's Great About It: This bouncer is perfect for resting, playing and bedtime. At the base of the bouncer, you’ll discover a set of buttons that let you to set the vibration and songs that will help your baby drift off to sleep. There are three vibration settings and ten songs to choose from, and the three volume settings let you set it to your child's liking. My final bouncer is a fantastic all-rounder that’s perfect for all babies and any room. Providing your baby with optimal levels of support and comfort, the teddy-bear design is perfect for your little bears, whether they’re resting, sleeping or playing. At the top of the bouncer, you’ll find two cute hanging teddy bears, perfect for entertaining your child when they’re awake. The bolster and headrest are removable for easy cleaning and help to provide outstanding levels of support, perfect for encouraging healthy growth and body development. There are two adjustable reclining positions to choose from, ensuring your baby is happy and active at all times. What's Great About It: By your baby’s feet, you’ll find a small, easy-to-use control panel that lets you choose the sleeping and music settings of the bouncer. There are several vibration settings to choose from, accompanied by 7 lullaby's; and the volume control allows you to set the best possible sleeping conditions for your baby. There’s also an auto-shut off feature, so you can leave the room while your baby sleeps undisturbed. Every baby is different and has their own set of needs and requirements, whether it’s bedtime or playtime. As you can see above, there are many different bouncers to choose from, each with its own unique set of features and functions. To choose the best bouncer for you and your baby, follow my step-by-step buying guide below, which gives you all the information you need to make the perfect purchasing decision. One of the first things you’ll want to consider when purchasing a baby bouncer is what kind of bouncer you need. There are three main types to choose from: a manual bouncer, a battery-powered bouncer or a plug-in bouncer. A manual bouncer has no electronic parts. This means you can easily take your bouncer with you wherever you go. You could even take it out and about with you when you are on the move. These bouncers have no sounds or vibration settings but usually have more sleek and comfortable designs. They can vary dramatically in price. A battery-powered bouncer will also give you the ability to take your bouncer with you wherever you go, but you are restricted to the life of the battery. On cheaper models, the battery life will last for only a few hours. With this in mind, these bouncers may have lights, sounds, and vibration settings, but you will have a very limited choice. The most important aspect of any baby related product is the safety system it provides. When shopping for the ideal bouncer, look for a five-point harness system, or at the very least, a three-point harness system. This will secure your child between the legs and around their waists, minimizing the risk of escape. This means that you can complete your tasks without worrying that your child may fall. The framework is a very important aspect of any bouncer to consider. Every bouncer has a different design and is a different height from the floor. Bear this in mind when it comes to your baby. If you have a relatively active baby, you’ll need a sturdy framework that is lower to the ground to minimize the risk of tipping over. Always choose the lowest and widest bouncer possible. This way, you can be sure that your baby will be safe as well as comfortable. If you plan on using your bouncer out of your home, check that the framework of the bouncer can fold away into an easy to carry, compact unit. If you want your bouncer primarily for sleeping purposes, this may not be a relevant aspect but if you are planning on using your bouncer throughout the day, this is vital. If you’re busy and your child becomes bored in their bouncer, this will almost always result in a crying, unhappy baby. By purchasing a bouncer that has a toy bar or connected toys at various points on the bouncer, you can make sure that your baby remains mentally stimulated at all times. There’s nothing better than seeing your child happily playing with a big smile on their face. It’s extremely likely that your child will fall asleep at some point throughout the day when in the bouncer. Many of the battery-powered and plug-in bouncers will come with a control pad. On this pad, you’ll be able to set various vibration settings, specially designed to softly rock your baby to sleep. Many of these bouncers also contain songs, melodies or lullaby's to help put your baby to sleep. This is a fantastic feature that’s becoming more and more popular within the baby bouncer industry, ideal for parents who are looking for effective ways to help their children to sleep. As with any baby product, hygiene and cleanliness are extremely important. When shopping for a baby bouncer, make sure the interior cushions are removable. This will save you a lot of time when it comes to cleaning the bouncer. Rather than having to navigate your hands around the bouncer trying to ensure you clean every part, you can simply throw it in the wash.
Nowadays, most bouncer cushions are machine washable, allowing you to easily remove and wash your cushions in a matter of hours, optimizing the amount time your baby can spend in the bouncer. Baby bouncers have been a game-changer when it comes to optimizing your day to day time as a parent. Not only can you then spend quality time with your baby throughout the day, you have the freedom to complete the tasks you need to, resulting in a happy household. It’s highly recommended that you write down a list of features that you want in your baby bouncer before buying one, allowing you to make the best purchasing decision for your baby.